Aug Mart is supporting SOPRO - Solidariedade e Promoção ONGD with 10% of the value of this purchase. Two-channel transistor guitar amplifier from LX series with an output of 120 W RMS, from limited edition produced in "camouflage" colour design. It features a 3-band EQ (Bass, Mid, Treble) for each channel (Clean and Distortion) and Extreme Tone Shaping feature. It also offers FX Loop, built-in reverb, CD input (phono) and solid construction with metal corners, grille and rubber feet. It has an input for footswitch (not included) jack instrument input, line-out jack and 2 outputs for speakers with impedance of 4 ohms. Very cool 4x12" Celestion cab in a limited edition camo finish. 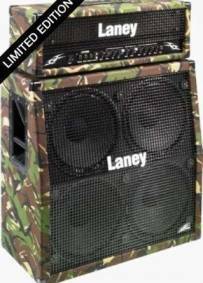 This Laney angled fronted cabinet also features a kick proof metal grille to keep it safe from unwanted damage. Preço em loja: €344 (cabeça) e €354 (coluna). Preço eSolidar individual: €299 cada! »»NOVO! »» Com 2 anos de garantia! Artigo de exposição em loja. This item will be sent from Barcelos, Portugal. Artigo preferencialmente levantado em mão devido ao seu peso.